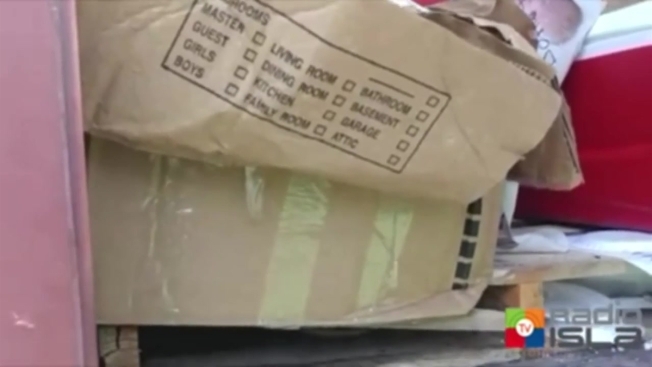 A local radio station in Puerto Rico said it found neglected shipping containers full of donated supplies to Hurricane Maria victims damaged and covered in animal droppings. Radio Isla 1320 AM posted a video on Facebook on Friday showing the conditions of the containers with items that were to be distributed by the National Guard. About 10 containers of donated supplies were located at a state elections office. A spokeswoman for the elections office said the donations were being managed by the National Guard. Isabelo Rivera Negrón, adjutant general of the Puerto Rico National Guard, told Radio Isla that the majority of items donated were properly distributed but that some items could not be provided due to issues such as items being expired. Water, baby supplies, medicine and food, including cases of beans, were found covered in rat droppings, according to Radio Isla. Rivera Negrón said items such as batteries, fans and non-perishable foods will be "delivered shortly to non-profit entities and to affected people." U.S. government and Puerto Rican officials have been criticized over their response to Hurricane Maria, which officials now estimate killed more than 1,400 people after striking the island in September. Hurricane Maria, as well as Hurricane Irma two weeks later, knocked out power and water to the island and caused widespread flooding. The outages and lack of access to food, water and services persisted for months as the island struggles to recover nearly a year later.